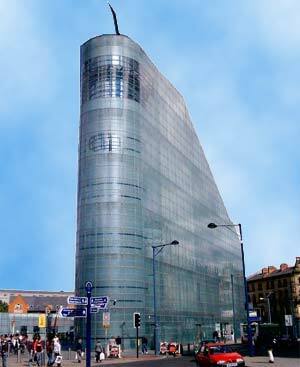 The Urbis in Manchester is an international center that opened in 2002. This architectural wonder of shimmering glass designed by Ian Simpson Architects has 4 floors of interactive displays of various cities such as Los Angeles, Sao Paolo, Singapore, Tokyo and Paris. The Urbis is conveniently located in Cathedral Gardens in Manchester?s Millennium Quarter. It is well connected by train and tram services. The glass skin that makes the Urbis comprises 2,200 glazed units. This forms the sculptured surface of the building. The Urbis in Manchester provides a bird?s eye view of Manchester?s new Exchange Square and the rest of the city. A main foyer greets any visitor into the Urbis. A visitor can then visit the shops, caf? or seminar and corporate entertainment spaces. Level One offers viewers large-scale exhibitions that provide insight into the dynamics of the city. Levels two, three and four throw light on the challenges of orienting to cities around the world. The restaurant and bar on the fifth and sixth floor of the Urbis can be directly accessed from another entrance. This glass monolith offers visitors a one-minute sky glide in the MEN Glass Elevator. Enter a fascinating journey of discovery with interactive displays, audio visuals and moving video footage at the Urbis in Manchester.